Ottawa Senators fans will forever be grateful to their one-time general manager, Bryan Murray, who traded picks with the Nashville Predators in order to put the Senators in pole position to draft a young Erik Karlsson at the 2008 NHL Entry Draft. The 6 feet 0 inches (183 cm) tall, 191 lb (87 kg) heavy defenseman has gone ahead to rise to the position of captain of the team while winning awards like the James Norris Memorial Trophy and the Viking Award along the way. Read on to find out more about his career and his personal life. Erik Karlsson was born Erik Sven Gunnar Karlsson to Ulla-Karin and Jonas Karlsson on the 31st of May, 1990, in Landsbro, Sweden. As a child, Karlsson only thought about playing hockey, a dream he shared with his father who helped him to achieve it by playing and teaching him the ropes of the sport. There is not much information available about the education that he received while growing up, however, in an interview in 2016, the athlete revealed that he struggled in school because he did not have the same level of passion for it as he had for playing hockey. In 2006, Karlsson got signed by Swedish junior ice hockey team, Sodertalje SK. The next year, he moved to Frolunda HC where he played for their junior team before making his debut for the senior side in March 2008, in a sold-out game against Swedish giants, HV71. The 18-year-old did not look to be in above his head as he was able to get the game-winning goal in overtime to secure a playoff position for his team. That same year, he was selected to represent Sweden at the 2008 IIHF World U18 Championships where he was named the tournament’s best defenseman. Erik Karlsson’s achievements were noticed by the Ottawa Senators of the NHL, who went on to draft him with the 15th overall pick. In September 2009, the young Swede attended the Senator’s training camp and went on to land a place in the team’s roster for the 2009-10 season. He stayed with the Senators for 9 years, reaching the position of captain in 2014, before he was traded to the San Jose Sharks in September 2018. In the 2011-2012 season, Erik Karlsson set a new Ottawa Senators franchise record for points by a defenseman in a season with 78. The following year, he set another franchise record, this time, the most goals in a season by a defenseman with 20. Unfortunately, 2013 was also the season when he suffered his first major injury, lacerating his Achilles tendon. The injury required surgery and proceeded to keep him out of action for ten weeks. Following his return, Karlsson did not miss a game in four years, playing in 324 consecutive games to set a team record of consecutive games played in, before getting hurt from blocking a shot in March 2017. As of the completion of the 2017-18 season, Karlsson has played in 627 ice hockey games in his career, scoring 126 goals and 392 assists. 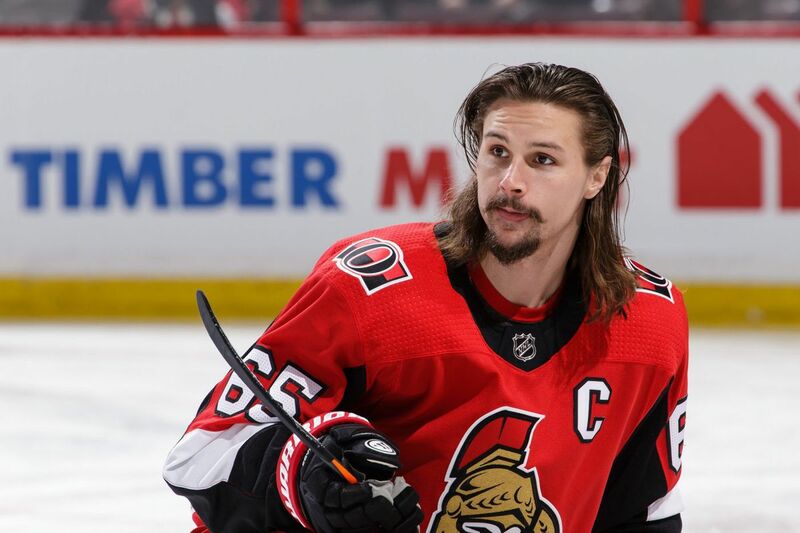 Erik Karlsson has come a long way from the time when he was earning an average salary of $1.3 million per year from his 3 years $3.9 million contract with Ottawa that was agreed in 2009. In 2012, at the expiration of that deal, Karlsson signed a 7-year deal worth $45.5 million. This means that the two-time recipient of the James Norris Memorial Trophy will be taking home an average salary of $6.5 million until that deal expires. Does Erik Karlsson have a Wife or Girlfriend? Erik Karlsson is currently in his second marriage. His first marriage was to Therese Karlsson in 2012. The pair were together for about a year before calling quits in 2013. After a few years, Karlsson entered into a relationship with Melinda Currey, who he eventually married in August 2017. As the story goes, Karlsson proposed to his love in late 2016 by putting an engagement ring in a pizza box. Currey accepted his proposal and immediately took to social media to share her joy. Following months and months of preparation, she and Erik got to exchange vows at the National Gallery of Canada. Daniel Alfredsson, a former Ottawa Senators player and captain served as Karlsson’s best man while country musician, Dallas Smith, was hired to perform at the wedding. Not much is known about Melinda Karlsson’s childhood life. She is known to have graduated from Carleton University, Ontario in 2010, obtaining an Honors Degree in communications and doing a minor in psychology. After graduation, she enrolled at Algonquin College where she studied French before going on to take up the position of Chief Marketing Officer at a digital creative agency called Wellington Creative. On the 22nd of November, 2017, three months after tying the knot, Erik Karlsson announced that they were expecting their first child. A few weeks later, the overjoyed parents-to-be revealed that the baby was going to be a boy. In March 2018, however, the couple took to social media to share devastating news, revealing that their son, whom they named Axel, was stillborn.